If YOUR “ego” is out of control THEN your “ego” is out of YOUR CONTROL. Your “ego” is the enemy within “possessing” radical autonomy without. Your ego CAN CONCEPTUALLY become your most trusted internal “advisor” once again EVEN if only for the purpose of consolidating your Selves into something particularly knowable and understandable. The culmination of such reframe for the high IQ “white” male mired in radical autonomy is just plain genuine white Supremacy… That movement of white men who believe in and therefore strive towards Perfection, ie., objective Supremacy. AND THIS IS EXACTLY our collective reality. The ensuing chaos is in the mass denial. Just look at the photo… If one didn’t know Hitler and was only in the mindset of fashion… What would he say? Pristine… Sharp… Angular… Rigid… Stern… Now, one learns this man is an anti-Christian. Now what? 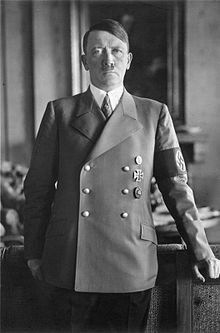 Then you come to find out that this man was against “Jewish supremacy.” So “we” have an anti-Christian anti-Jewish supremacist who also believes in organizing his nation under a socialist economic order ROOTED in racial hierarchy. What does any of this have to do with a white man who believes in and therefore strives towards objective Supremacy? When do you “see” A LEARNED mis-association resulting in pathological deracination.